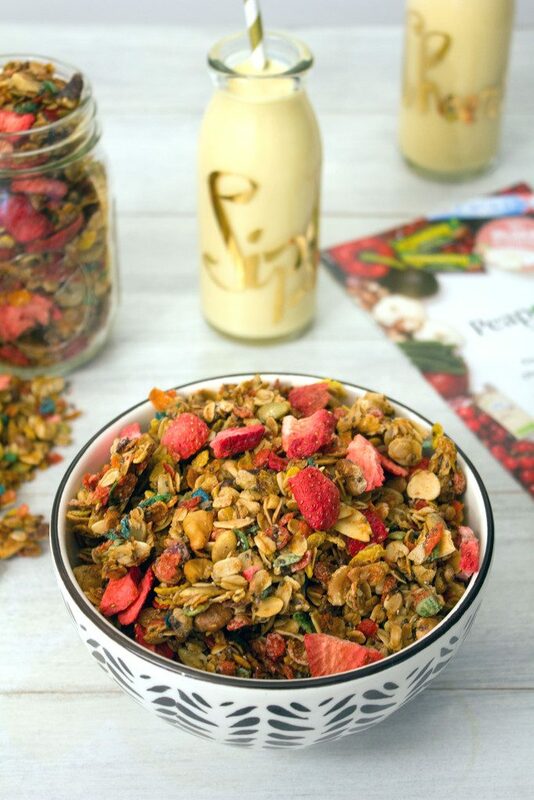 Kick boring old granola up a notch by making this Fruity Granola with Fruity Pebbles and freeze-dried strawberries. 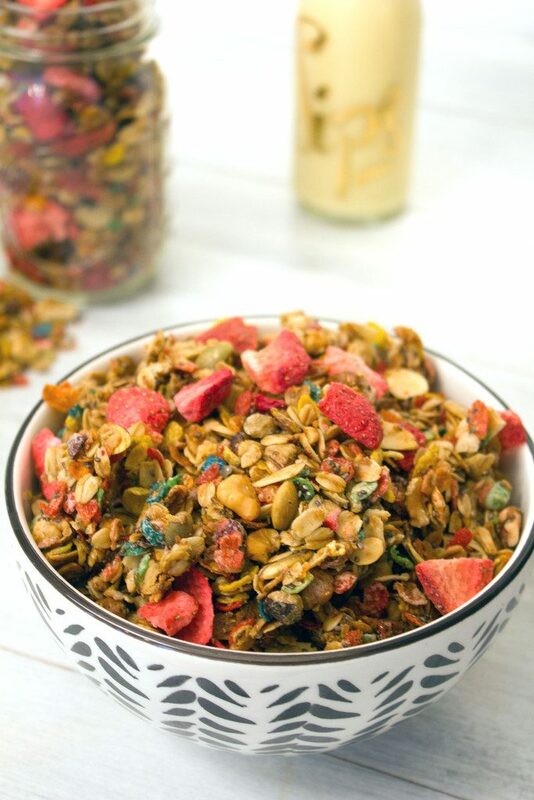 The bright colors and fruity flavors make this fruity granola the perfect hostess gift. Christmas week is here!! And if you’re like me you’re equal parts celebrating and freaking out. Because… how many things on your to-do list did you not get to yet?? And why is there never enough time to get everything done during the holiday season?? Ugh. Luckily, this post contains a tip or two. While I may not be an efficiency expert (seriously, I barely sat down this weekend and still only got through a little over half my to-do list), I love finding easy solutions to saving time where I can. Not only am I giving you an easy recipe for Fruity Granola that makes the perfect host/hostess gift at this time of year, but I’m telling you how you can make it without ever leaving your home. Swoon! Have you guys heard of Peapod? It’s an online grocer that delivers to homes and businesses. I’m partnering with them on today’s post and am excited to share what they’re all about and give you a chance to win a Peapod gift card for groceries or a PodPass of your own! I actually used to use Peapod quite often when I lived in the city several years ago. I shudder when I remember walking to the grocery store and carrying tons of heavy bags back to my apartment. I would walk a couple blocks, stop, put down all my bags, readjust, and continue on. Peapod basically saved my life back then. 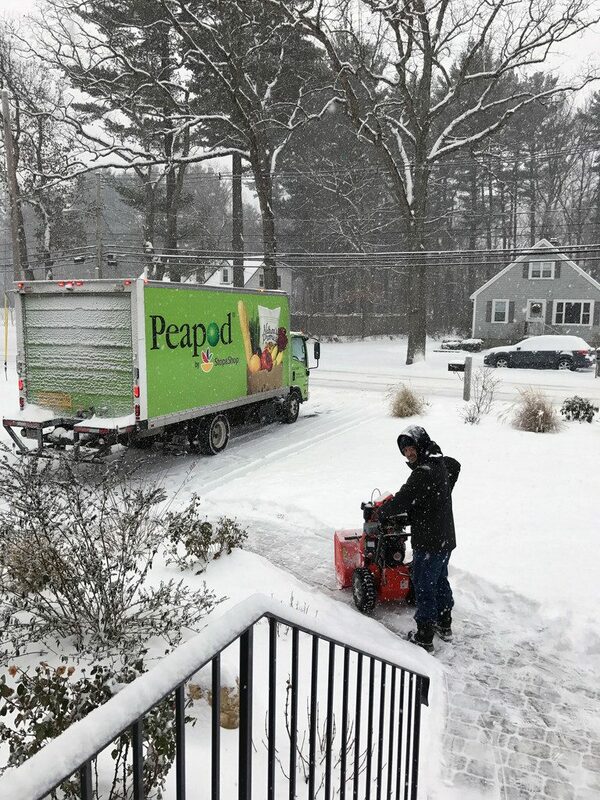 My Boston office actually uses Peapod now, but to be honest, I had no idea they even offered the service out in the suburbs until they reached out to me a couple weeks ago. While getting to the grocery store is a whole lot easier for me now that I have a car and live close to one, I still pretty much always dread going. Really, I have a love hate relationship with the grocery store. 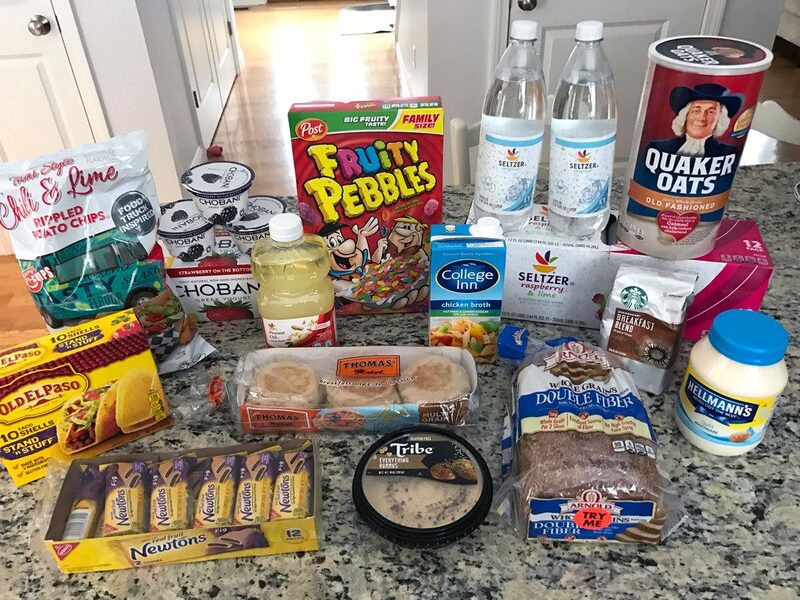 I love the idea of it… Wandering through the aisles, checking out all the new products, and carefully selecting what I’ll purchase based on price, nutrition, and packaging. But the reality of it is that I hate wasting a weekend morning at the grocery store, I hate the crowds that are always there on the weekends, and I just plain hate getting out of my pajamas first thing on a Saturday. This past weekend was an especially awesome weekend to take advantage of Peapod since we woke up Saturday to a whole lot of snow and the last thing I wanted to do was leave the house. I placed my order on Friday for a Saturday morning delivery and it was just as easy as I remembered it being. You can sit and leisurely fill your cart, checking out the sales and wide variety of products. Personally, I love that you get a running tally of what you’re spending as you go, unlike when you’re at the grocery store and only realize how much you’ve spent when you get to the register! Peapod also saves all your orders so you can easily re-order the next time you shop. This is huge for me since I have quite a few items I buy every single time I’m at the store. My delivery came right on time despite the horrendous weather. Hooray for a house full of groceries and me still in my pajamas! Obviously, Winnie was quite curious about this magical delivery. I do wish Peapod had a reusable bag option, but we re-use plastic grocery bags all the time in my house, so these will definitely be utilized. I got what’s a pretty typical haul for me. I try to do all my grocery shopping in one trip (or in one order in this case!) a week and that includes making about 4 dinners/week, breakfasts and lunches to bring to work, and anything I make for the blog. 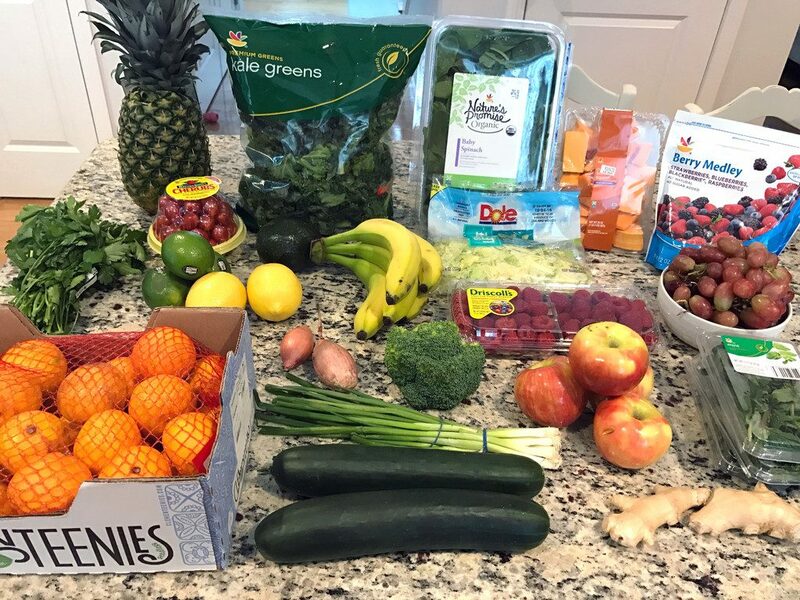 One reason I’m sometimes nervous to get my groceries delivered is because I like being able to pick out my own produce… But I’m happy to say everything I ordered from Peapod looked great! There is a bit of a learning process to ordering… For instance, I didn’t realize how little one “crown” of broccoli would be. Next time, I’ll order a couple! I’m so happy they had my precious bagged kale. I know it’s not that difficult to clean and chop kale, but buying it already prepped in the bag is one of my simple pleasures in life. Somehow these two very important groceries got left out of the above shot. ‘Tis the season! 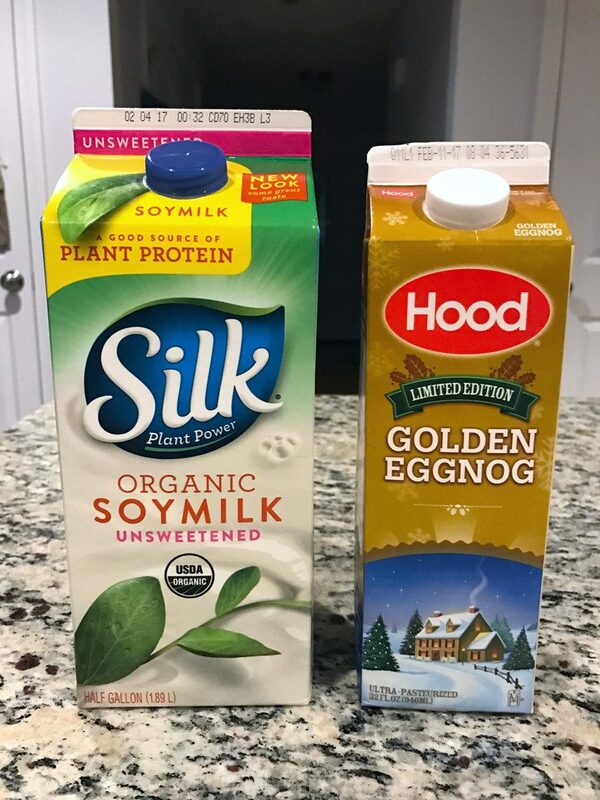 Eggnog is one of Chris’s all time favorite things and I’m pretty sure we’ve had it in our house since Halloween. I usually take leftovers to work for lunch, but Chris likes sandwiches, so I was happy to see Boar’s Head deli meat available on Peapod. And plenty of organic, grass-fed meat, too. Right after my delivery arrived, I put it away and got baking! I decided to make what I think of as a pretty perfect hostess gift. Doesn’t it always seem like right when you have your gift shopping list complete, you remember that you’re headed to a party and have nothing to bring the host? 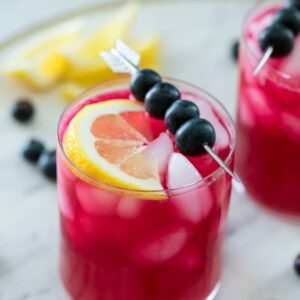 While a store-bought gift or something for the party is always great, I love the idea of bringing the hosts something they can enjoy the next morning. You know, when they wake up feeling a little bit hungover and their house is a mess and the last thing they want to do is think about making breakfast. I opted for granola, but gave it a little bit of holiday spirit with a fruity flair! This Fruity Granola involves old fashioned oats, Fruity Pebbles, walnuts, almonds, pumpkin seeds, and chia seeds, with freeze-dried strawberries mixed in at the end. It’s ridiculously easy to make and one batch will provide you with about six mason jars full of granola. I’m a big fan of simply eating granola in a bowl with milk, but also love the idea of sprinkling this Fruity Granola over yogurt or ice cream or incorporating it into a holiday dessert. Since I’m a firm believer in the “one for you, one for me” strategy of gift buying, I recommend giving a few of these jars away, but also keeping a few for yourself. Because even though you may not be throwing the party, you still attended and had some fun and don’t really want to make breakfast in the morning, either. At least your house isn’t a mess? Sooo, dare I ask if you’re done with your Christmas shopping yet? Touchy subject? If you’re not, leaving your house to go to the grocery store is probably the last thing you want to do, right? Or maybe going to the mall is (thank goodness for Amazon Prime!). If you’re still trying to plan your holiday menu (me too! 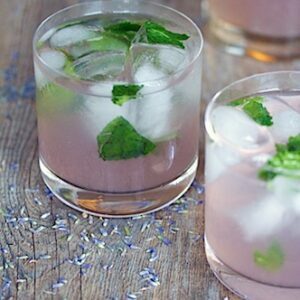 ), Peapod has a great recipe content site, FromthePod.com with some super fun ideas. Basically, why don’t you just sit down and let Peapod do pretty much everything for you this season? Guess what? You can! 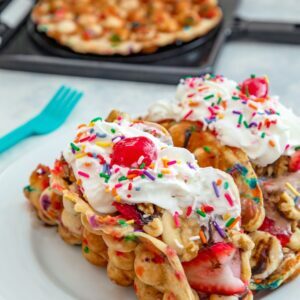 I’m giving away a $119 gift card to Peapod today. 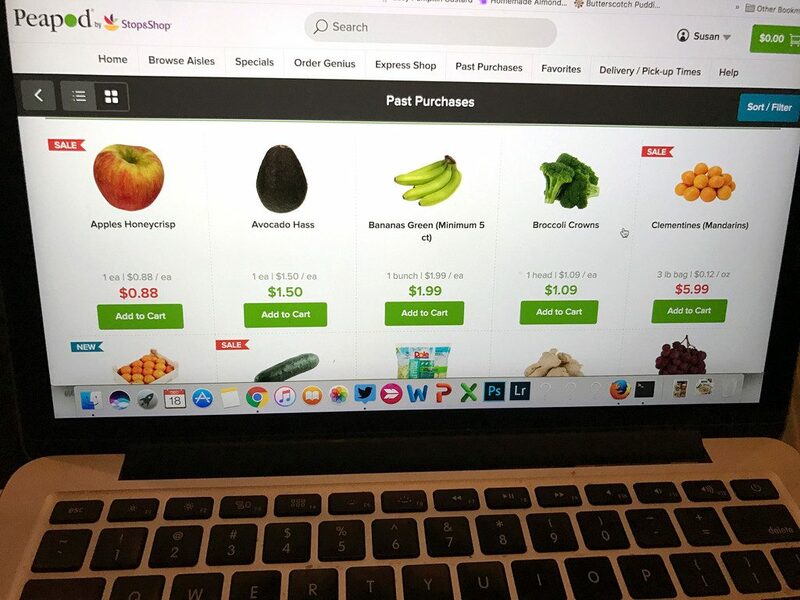 You can either use the gift card for groceries or you can use it to purchase a PodPass, which will get you free delivery on all of your orders (so long as you spend at least $100). Imagine waking up every weekend to a house magically filled with groceries? Especially at this time of year! Now if only they’d put the groceries away for you (I didn’t ask, but our delivery guy was super nice, so maybe he would have?). 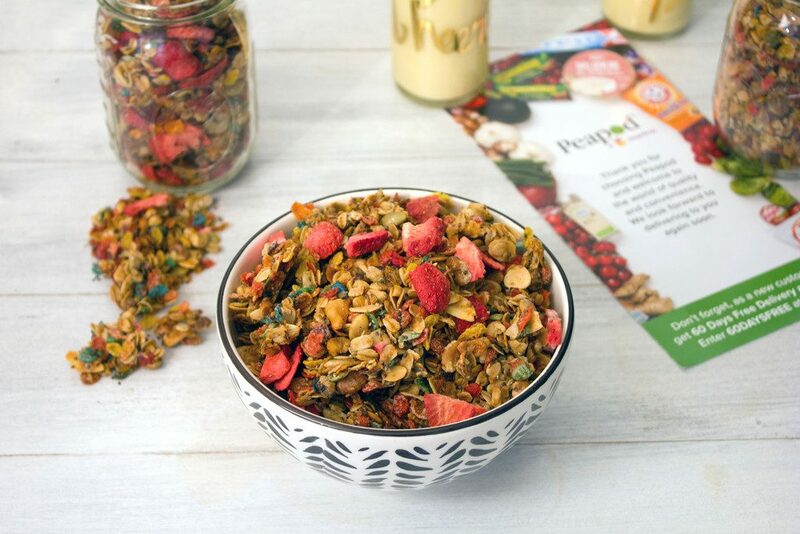 You can kick back and relax with your Fruity Granola while enjoying this otherwise hectic holiday season. To enter to win a Peapod gift card, simply comment on this post letting me know how often you usually go to the grocery store. You have until Friday, December 23, at 11:59 p.m. EST to enter and must live in the U.S. to qualify. If you’re looking for another cereal-based granola recipe, check out these Chocolate Peanut Butter Cheerios Granola Bars. This Quinoa Granola with Dark Chocolate Pomegranate is also delicious! Pre-heat oven to 275 degrees. In a large bowl, mix together old fashioned oats, Fruity Pebbles, walnuts, almonds, pumpkin seeds, and chia seeds. In a medium saucepan over low heat, stir together coconut oil, maple syrup, and vanilla until coconut oil is completely liquid and mixture is warmed. 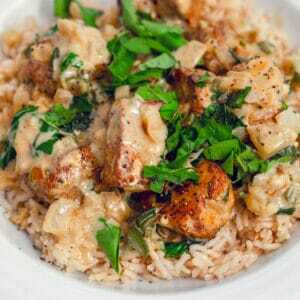 Pour coconut oil mixture over oats mixture and mix together until well-coated. 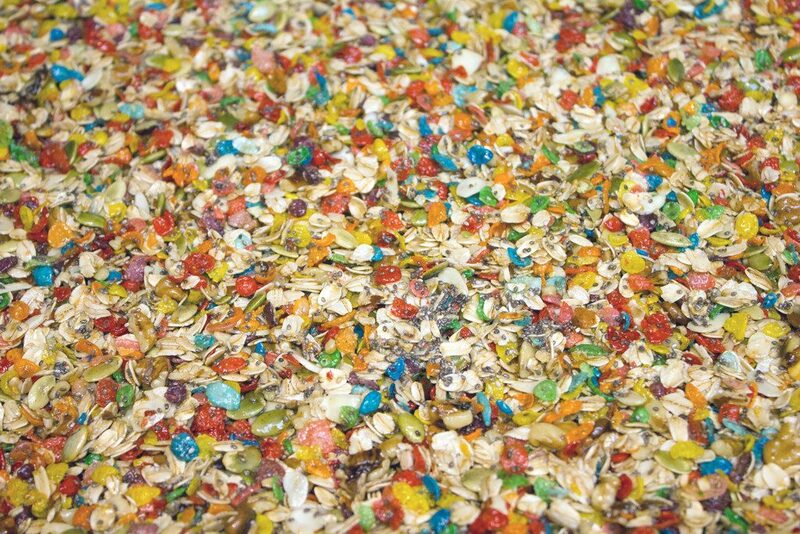 Spread the mixture into a single layer on a large cookie sheet. Bake at 275 degrees for 40 minutes, stirring mixture halfway through. Remove from oven and let rest (without stirring) until cooled. Once cooled, break into clusters and stir in freeze-dried strawberries. Full Disclosure: This post was sponsored by Peapod, but as always, all opinions are 100% my own! 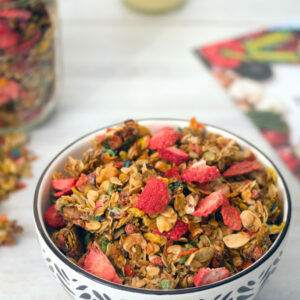 20 Responses to "Fruity Granola with Fruity Pebbles and Freeze-Dried Strawberries"
During the holidays I’m there daily! I try to go only once a week but inevitably end up back at least once or twice…I love the idea of double checking your list with Peapod so no ingredients are forgotten! I also try to keep my grocery shopping to once a week! I can’t believe Christmas is this weekend!!! I still have stuff to do and the time is going by so fast! I’ve never heard of that grocery delivery service before, but sounds awesome. We had 3, yes 3, snow storms last week. While I do love grocery shopping, I don’t like out and about in the cold snow! Who does, right? 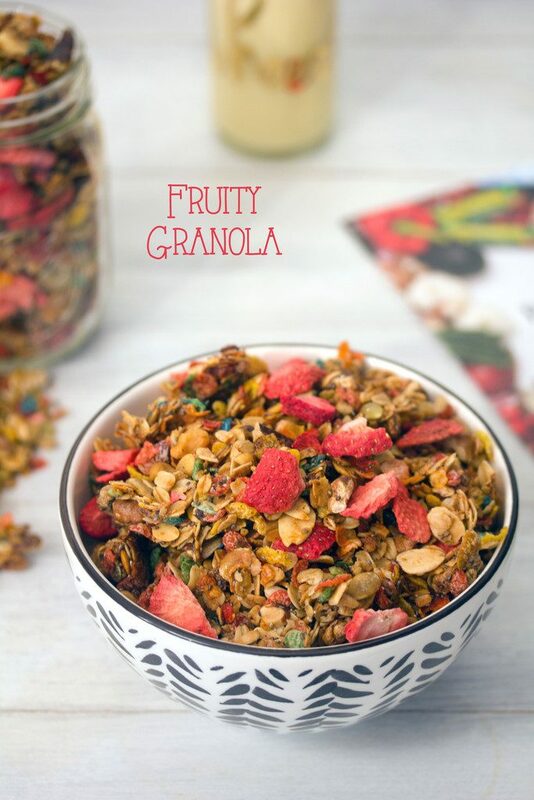 This fruit granola is so fun with the fruit pebbles in there….just enough sweetness, but still healthy 😉 Perfect with yogurt too! Hope you have a very Merry Christmas and Santa is good to you 🙂 !! I’ve heard of peapod, but never tried it. I do so hate going to the grocery store though. Mine is always so crowded! 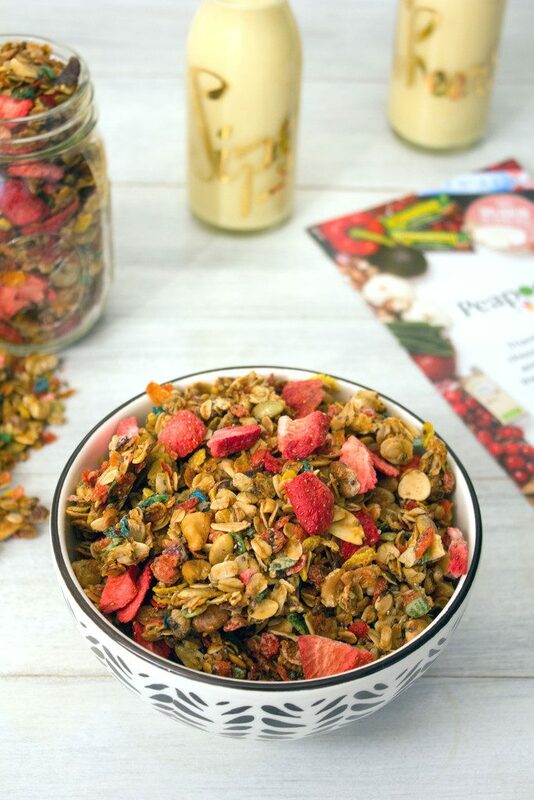 I am a serial cereal mixer haha.. so I love that you added Fruity Pebbles to granola! I wish we had Peapod in TN…even though I live close to grocery stores I still dread the task. I’m in awe that Christmas is less than a week away…excited and in disbelief! And this fruity granola looks perfect! Fruity Pebbles is my FAVORITE cereal, I have two boxes in my pantry right now, so this was made for me. And Peapod sounds wonderful! I like grocery shopping for the most part, but especially in the snow, this would be a lifesaver! I don’t mind grocery shopping so usually go 2-3 times a week buying what I need for the next few days as I plan meals and baking. 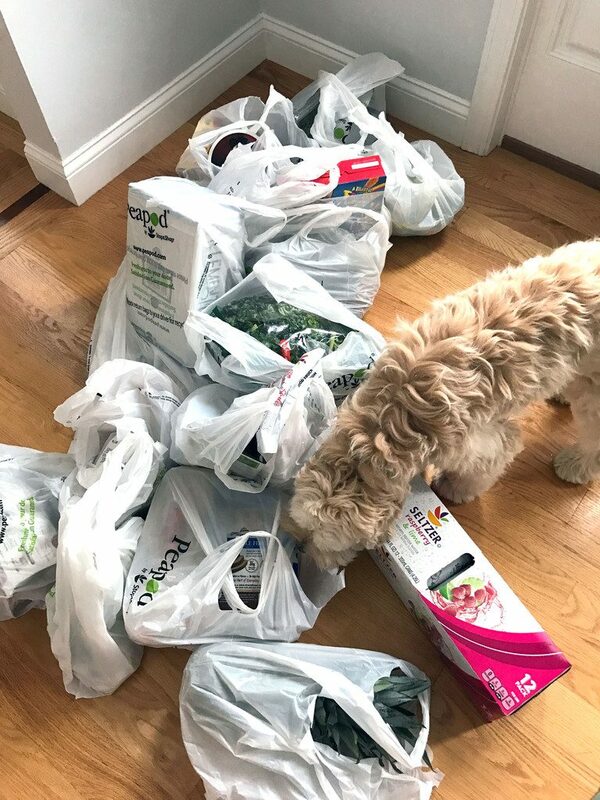 I’ll have to look into peapod – a grocery delivery service must be so convenient – especially during the holiday season. 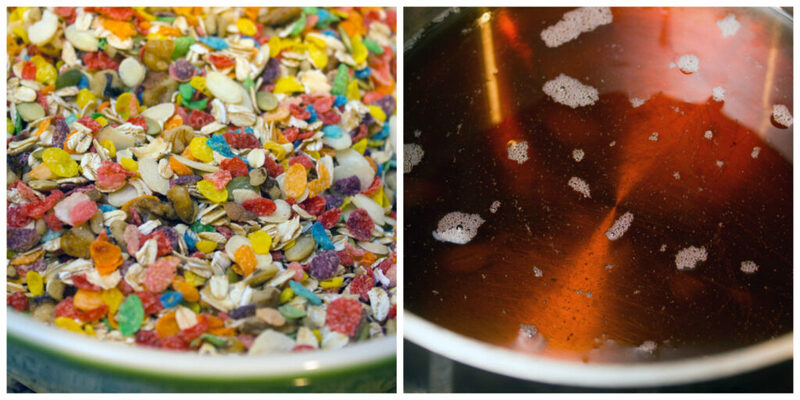 And fruity pebbles and granola – that sound so crazy delicious! I go several times a week!!! I go 2 to 3 times a week!! I relate to your story… I live in NYC so frequent trips are a must…. I totally agree it’s a pain lugging back all the grocery bags to my apartment especially when it’s so cold! 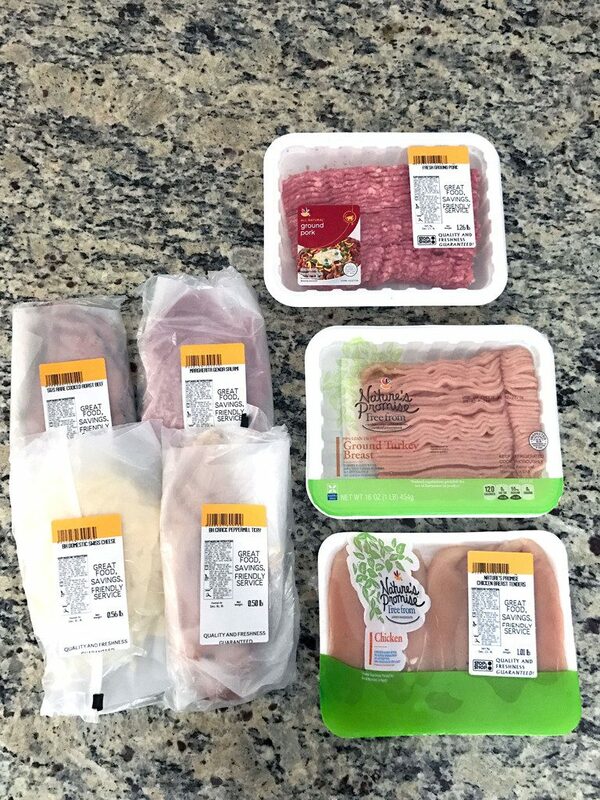 Grocery delivery is amazing!